BondiBet Casino welcomes all new players in style, with 25 free spins for everyone (no deposit required) and a huge 200% welcome bonus up to $/€2,000! Nothing can create that sweet, tingly sensation like a big welcome bonus just waiting to be claimed and give you a shot at a gambling glory. One such offer comes to us from BondiBet Casino, where all new players can start their gaming adventure with a huge welcome bonus of 200% up to $/€2,000 and 25 free spins (no deposit required) to get you where you want to go! It isn't often that offers like this come around so if you enjoy trying your gambling luck, this bonus is just too good to pass on. To claim this huge welcome offer, you simply need to make a qualifying deposit of $/€10 or more and the casino will boost your bankroll by 200%, so even if you deposit just the minimum, you'll have $/€30 to play with. To claim the bonus, make sure you select the offer from the cashier when making a deposit. The offer comes with 35x wagering requirements on the entire amount (deposit + bonus), which isn't bad at all for such a huge boost to your bankroll! If you aren't in a position to make the deposit right away, that's not a problem. BondiBet Casino is in a holiday mood and they give all new players 25 free spins simply for joining - no strings attached and no deposit required. Any winnings resulting from free spins need to be wagered 20 times and the maximum you can cash out is $/€100, which is a nice chunk of change since there is no risk involved. 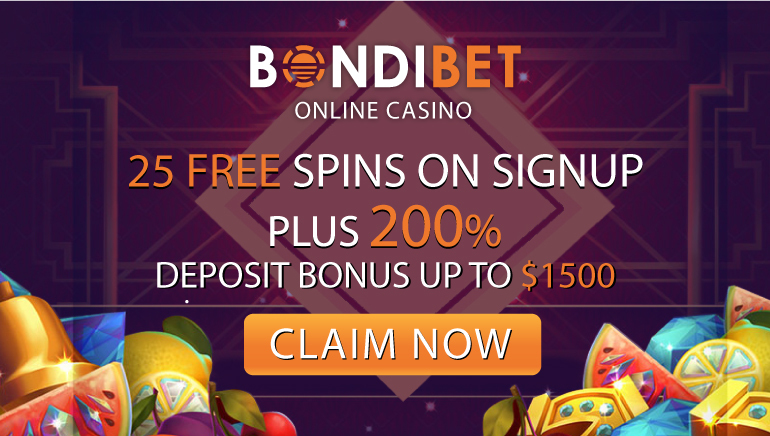 So, whether you like big deposit bonuses or would like to try your luck but don't feel like taking a gamble, BondiBet Casino has you covered. Sign up today and see what Lady Luck has in store for you!